Shaws of Darwen are extremely proud to have been awarded Gold in Best of Kitchen at the KBIS show for our Waterside 800 sink. "On Saturday, April 20, 2013, at the New Orleans Ernest N. Morial Convention Centre, winners of the best of KBIS awards were announced during KBIS 2013. This annual competition showcases the newest and most innovative kitchen and bath products. Products are judged on excellence and design, functionality, quality/durability, flexibility and aesthetics/style. The awards were presented on Centre stage at the NKBA booth by Alan Zielinski, immediate past President of the NKBA, CKD, Better Kitchens, Inc.; and Cheryl Kees Clendenon, owner and lead designer of Detail Interiors." 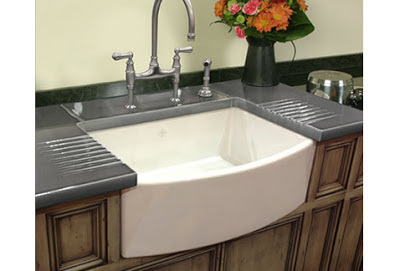 Shaws of Darwen have been handcrafting the finest quality ceramic kitchen sinks in Lancashire, England since 1897.